A fresh approach to dementia has earned an Aberdeen theologian a prestigious literary award which comes with a £10,000 prize. Professor John Swinton is the 2016 winner of the Michael Ramsey Prize for his book Dementia: Living in the Memories of God. The award is the ‘Man Booker of theology’ which celebrates the most promising contemporary theological writing and Professor Swinton was presented with the prize by the Archbishop of Canterbury, Justin Welby, at the Greenbelt festival. 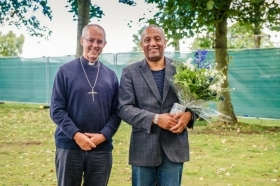 Professor Swinton is a former mental health nurse and hospital chaplain and says the theological dimension to the study of dementia emerged from his practical background. “Through my work as a mental health nurse I have spent a lot of time with people who have different ways of seeing the world,” he added. “The book brings together my nursing and chaplaincy background in a theological context. It reconstructs dementia in a more positive way from being tragic to being surprisingly hopeful. The 2016 Prize was judged by a panel including the Archbishop of Canterbury, the broadcaster and writer Sally Magnusson, Archbishop Josiah Idowu-Fearon, Secretary General of the Anglican Communion, Dr Anna Rowlands a Lecturer in Catholic Studies in the Department of Theology and Religion at Durham University and Professor Rosalind Searle, Director at The Centre for Trust, Peace, & Social Relations.